Welcome to the Iron & Needle! I’m a member of the 2015 New Quilt Bloggers group and it’s my week to post for our blog hop. The blog hop has been great so far and I’m excited to share my blog with you. I’m an elementary French, Kindergarten and Phys. Ed. teacher in Ontario and I love my job. I also like sports, especially hockey, lacrosse and kayaking. I love to read and when commuting cut into my reading time I started listening to audiobooks. Now I’ve always got one on the go to sew with. I started quilting around the same time I started teaching, four years ago. I sewed a messenger bag out of a jacket my mom was finished with, then a ruched duvet cover out of three flat sheets. My mom had just joined a quilting class and suggested I join to learn some techniques. You know, pressing, pinning, rotary cutting- because apparently that’s how you’re supposed to do it. I thought quilting was for “old people” and declined. (Oh, was I wrong!) But the next fall I agreed to try and sewed my first quilt. I liked it, but still wasn’t sold on quilting and continued my own projects, until I came across some Lotta Jansdottor fabric on Etsy. I fell in love and drafted a design based on a baby quilt I had seen. Since then, I’ve gotten more and more into quilting! My plaid messenger bag, sewn from a blazer. The construction is poor but I'm still proud of the design. In quilting, I favour bright colours, solids and tone-on-tone prints. I love white backgrounds and negative space, so your eye has somewhere to rest in the background. I’m often drawn to quilts with non-traditional layouts, sometimes asymmetrical, but with balance. Below are some of my favourite quilts I’ve designed and sewn. Solids and prints, piecing and applique, cameras and film. This top is headed off to the long-arm quilter soon for some custom quilting. 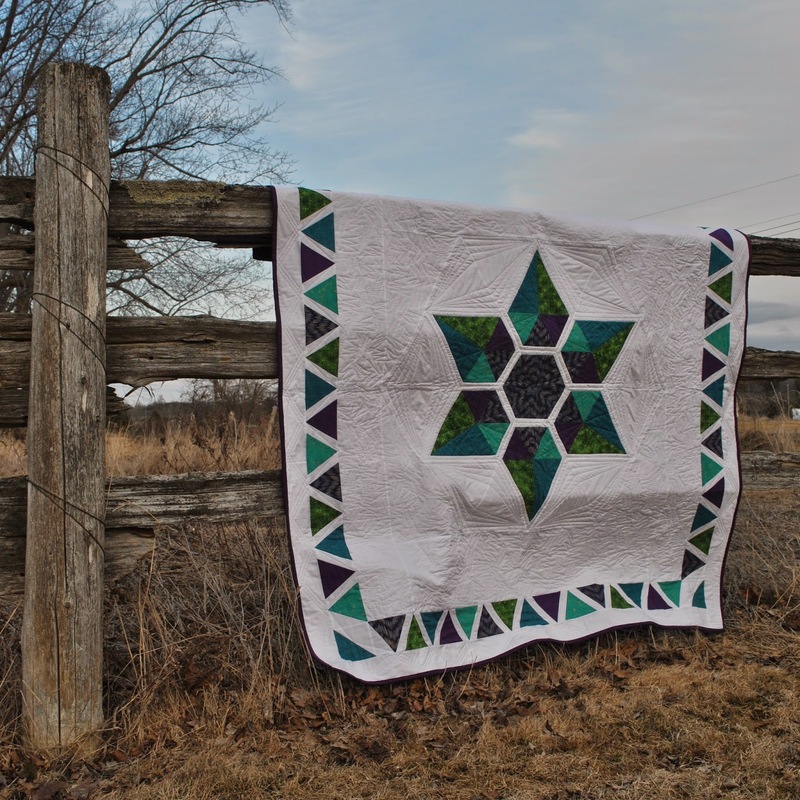 A medallion quilt with lots of negative space, just the way I like it. Uncluttered. This one I quilted myself! Though I’m still relatively new to quilting, along the way, I’ve learned a lot about sewing and myself. One of those things is patience. A quilt seems to take a long time to finish at first, but I’ve gotten better at enjoying the process more. Another is how much fun it is to take a class and sew with a group of ladies, even when there’s a wide age difference. It doesn’t seem to matter. I’ve also discovered that my favourite part of quilting is the design process - gathering inspiration without even knowing it, with all these ideas floating around in your head. Then designing a layout, choosing fabrics and playing with colours. Then doing all of the math and breaking it down into all the little steps – how to piece it together, which steps to do first, how much fabric I need and what to cut. I spend a lot of time just visualizing how it’s all going to come together. I started keeping a sketchbook and binder with quilt designs, since my imagination seems to move faster than my sewing machine. I’ve found that once I’ve designed a quilt, I don’t always have the same urgency to make it, and that it’s okay to leave them there for later and maybe come back to it. While I used to hate pinning and pressing, I’ve even come to find that relaxing lately. That’s where my blog name comes from. Though the design process is my favourite, most of my time is spent pressing, pinning and sewing – and so, the Iron & Needle. Of course, the whole “leave the designs in the sketchbook” idea doesn’t always work and I’ve got a few projects on the go right now and couldn’t help myself. I’m sure more urgent ideas will pop up, so I’m trying to be flexible and not plan so much. I can’t wait to share the ones I’m working on later this summer. How about you? What’s your favourite part of quilting? Was there a particular project that got you hooked? Would you like to share any lessons you’ve learned through quilting? Your quilts are beautiful! I cannot wait to see Tornado once it is finished. There is a lot of interesting negative space for someone to play with. Negative space in a quilt use to scare me, but I've grown to love it. My favorite part of quilting? Oh man, that is a tough question. I do love the design process, piecing is so much fun and rewarding, quilting has turned into a joy since I have jumped in and learned free motion quilting, and I love how meditative sewing down the binding on a project is. The only thing that frustrates me in the process is the fabric prep to get started!!! :) I totally agree that it is a pure delight to get to sew with others, and I am hoping to find more ways to do that in the future. So lovely to get to know you better! Glad to have you in my hive Brianna especially since we've been visiting each other's blogs since before the hop started. I hadn't seen your tornado quilt but it is just LOVELY! I love your plaid bag, no matter what construction faults it may have it's so cute and it's got a story having been up-cycled and oftentimes I prefer a made item with a story more than a made item that looks factory polished. My favorite part of quilting is being able to express myself creatively through fabric. I always thought of myself as an artist with no artistic skills. That's a bit harsh but I always loved making art with my camera since I couldn't draw worth a darn and then when I realized I wasn't half bad at sewing fabric together into a different art/craft form I hadn't been exposed to before I was hooked! I love your quilt St. Andrew's Medallion! My favourite part of quilting is FMQing. Before I even get the top completed I'm already planning the actual quilting. I LOVE your photo shoot quilt, so unique and so fun!!! I love binding. For me that's the part of the process where you're SO close to the finish that the anticipation is almost too much. When that last stitch is taken and you shake out the quilt to look at it in it's entirety, I LOVE that moment!!! Brianna, you have the knack for quilt designing. It is clearly your talent. Sketching helps me too. Getting the idea on paper relieves the talking in my head. My favorite part of quilting is sitting down with a group of quilters and sewing or just chatting. We have so much fun. It keeps me from going crazy because I spend an inordinate amount of time working on a computer during the day. You seem to like that as well. It was nice to get to know you and to appreciate your work. Hello, nice to meet you! I love the quilts you've designed and made, the camera one is awesome! Oh I love Photo Shoot (all your quilts actually)!! You do beautiful work Brianna! My favorite part of quilting, every thing! From the first flicker of an idea, to designing, to picking fabric, to cutting, piecing, pinning, quilting and finally hand sewing the bindings! Dang!! I'm hooked! I think having a sketch book handy at all times is a great idea. You never know when an idea will hit you! Thank you for sharing yourself with us! your photo shoot quilt is gorgeous- love the half camera that is fantastic! I love the designing bit and the actual quilting less so. Least favourite bit is binding! So lovely to get to learn about your quilting journey Brianna. I don't know what it was for me. I think it was because I felt I was kind of rubbish at making clothing (which isn't completely true, I just need more practice) but I wanted to sew something. I made a lot of toys at one point, but eventually ran out of adult friends to embarrass by gifting them too. Quilting just really clicked with me. It was immediately obvious to me how to do the math to get the quilt or the block to the size I wanted, no muslin mock-ups, and so much wonderful fabric to choose from! I still find it really difficult to source garment fabric that I'd actually like to work with, so the very few items of clothing I make are made with quilting weight cotton. I have far too many ideas hanging out on my sketch pad. I really need to get some of those translated to fabric. It's tough though, because I have over twenty quilt tops that need finishing, and I think I'm the slowest quilter ever. I do joke, but I have a bad habit of kind of over quilting everything. I hope my sister likes that piece of fabric covered dry wall that I'm working on for her. I love Jewel Burst and Tornado. You have skills in quilt designing. I'd like to get there myself some day. Thanks for sharing. Hi Brianna, that photo shoot quilt is amazing! Love it! Your work is great, I can't wait to see what else you make. I enjoy the little things too, like pressing and pinning. Maybe because I have two busy little ones around me all the time, when I go to my sewing area, everything seems relaxing .. haha..
Nice to meet you Brianna. I love the dramatic contrast between the dark background and bursts of colour in Tornado - my kind of quilt! (Your other quilts are gorgeous too!) I agree that age difference doesn't matter when it comes to being with other quilt-minded people. I think that's one of the nicest aspects of quilting - we can all learn something from each other. I love handstitching the binding down and realising that I've finished something really unique and special. I love your use of a dark background on the St. Andrew medallion quilt, it's so dramatic and really makes the colours pop! I'm with you, I love the creative process in quilting - discovering something inspiring then figuring out how to turn it into a quilt. Wow, you are anything but a novice if you are designing your own patterns already! Great work, really impressive. I'm with you on design, I think it's my favorite, but I really love the putting it all together, too. I'm even growing to love the quilting part - it's a challenge, and I know I'm getting better with every piece. I never take classes, which is bad, I know. I'm hoping to take some at Quiltcon in 2016, we shall see. Sorry for the late comments, been on a long dream vacation, so I can't complain, but I've been so busy I got behind on the blog hop. Still, glad I caught yours and see you around. My imagination runs faster than my sewing machine too! I can spend all day every day thinking up quilt designs and doing the math. Also, I love your plaid messenger bag. Even though I don't do any 3-D sewing that bag makes me want to try. Hi, I'm Brianna. I love sewing, kayaking, playing, reading, photography and travel. I especially love to design modern quilts. Here, I share my projects and process. Enjoy!